The students, faculty, administration and alumni of Mater Dei High School are proud of its traditions of Honor, Glory and Love. 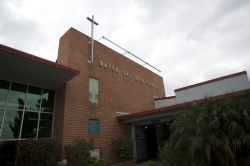 A school built by faith, dedication and help from the families and community around us, Mater Dei has a genuine commitment to Catholic education in the heart of Orange County. 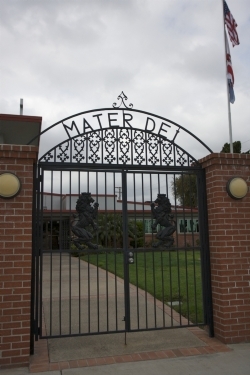 Mater Dei High School first opened in September 1950 with 111 students. During that first year, a statue of Our Blessed Mother was presented to the school by the Young Ladies Institute. It was placed in the Grotto, where it remains today. Mary, Mother of God, as our Patroness, guides us in our quest for excellence. The first principal was Father Joseph L. Eyraud, who supervised a faculty of seven, including the Sisters of Charity of the Blessed Virgin Mary. The first graduating class chose the lion as the mascot, and decided that we should be called the "Monarchs" and wear red and gray. They were also responsible for establishing the tradition of academic excellence at Mater Dei. 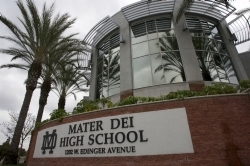 Mater Dei High School continued to progress. During the next few years, we added our band, a California Scholarship Federation charter, more buildings and finally, our first chapel. Our students came to know an unusually rigorous level of dedication and a work ethic that is still demanded today. In 1960, the school looked back on the first 10 years that added 1,300 students, in addition to a waiting list. We added our drama department in the 1970s and performed our first senior musical in 1974. Enrollment soon hit 2,200, making Mater Dei the largest Catholic high school west of Chicago. During the 1980s, we broadened our curriculum and further heightened academic standards in order to provide the excellent education our students needed for success in college life and beyond. We expanded our community service and outreach programs, making it easier for students to get involved. On the school's 40th anniversary in 1990, Fr. John Weling was named the first president of Mater Dei. Under his leadership, the existing Grotto was transformed to create the park-like atmosphere we still enjoy today, and Mater Dei began plans for the MD 2000 Capital Campaign. As the Mater Dei community continues its second 50 years, we are in the midst of the largest redevelopment project in the school's history. Phase I of the capital campaign has funded the construction of a parking lot, the Gordon & Gail Lee Family Chapel & Campus Ministry Center, the Antone & Anna Borchard Family Library, Academic Services Complex, the Reed & Angela LeVecke Student Activities Complex and Shamrock Plaza. Phase II brought the new Outdoor Athletics Complex including Rod Dedeaux Stadium at Joe O'Hara Field, the Rick Muth Track and two new FieldTurf fields. Construction is now complete on the Meruelo Athletic Center and William Lyon Homes Aquatic Center. The facility is home to the first pool on campus in school history, and one of the largest indoor athletics venues in Orange County, seating over 3,000 fans. Recent additions and upgrades to campus include the Andry Golf Practice Facility (2012), Aquatics Building and facility expansion (2013), and the Re-Imagined Library & Learning Commons (2013). Phase III plans include the construction of the first Performing Arts Center on campus and a parking structure to accommodate all students, faculty, staff and guests. The MD Vision 2020 Capital Campaign will build on the tradition of excellence inspired by its founders nearly 60 years ago. It is truly an exciting time to be a Monarch.